Bubba Watson is one guy who gets it. He's a professional golfer who doesn't take himself to serious and still has time to answer his many fans (has answer my tweets often) on Twitter and laugh sometimes at his practice round partner's shot (Rickie Fowler see below). He's genuine, honest and he's leading the WGC Championship after the first round. During an interview with the Golf Channel he mentioned he just "wanted to make the cut". When the reporter said there is no cut, he said, "Oh! good I made it". 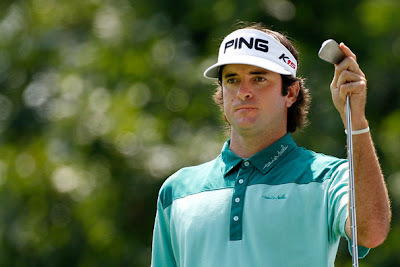 Bubba also wears cool clothing by Travis Mathew another reason to like him.